Hair is thick, medium-length with a thick under-layer of straight hair. This breed is curious and lively, and a good watchdog. It barks infrequently. This breed is curious and lively, and a good watchdog. It barks infrequently. This breed gets along well with other dogs, as well as children. It will bark when visitors come around. You can find Japanese Spitz puppies priced from $1800 USD to $1800 USD with one of our credible breeders. Browse through our breeder's listings and find your perfect puppy at the perfect price. This breed gets along well with other dogs, as well as children. It will bark when visitors come around. The coat is self-cleaning. Regular grooming with a brush and comb is required. Patience, understanding, and consistency are required in training the Finnish Spitz. The Finnish Spitz is happiest when it gets plenty of outdoor exercise. Japanese Spitz Puppies for Sale - Shipped Worldwide! Finding the right Japanese Spitz puppy can be dog gone hard work. PuppyFind® provides a convenient and efficient means of selecting and purchasing the perfect Japanese Spitz puppy (or Japanese Spitz puppies) from the comfort of your home, 24 hours a day, 7 days a week. Take advantage of our PuppySearch or leisurely browse our directory of hundreds of dog breeds, Japanese Spitz dog breeders, Japanese Spitz dogs for adoption, and Japanese Spitz puppy for sale listings with photos and detailed descriptions. Some Japanese Spitz puppies for sale may be shipped Worldwide and include crate and veterinarian checkup. 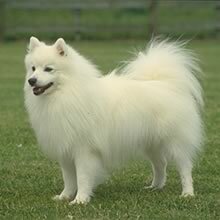 Many Japanese Spitz dog breeders with puppies for sale also offer a health guarantee. With thousands of Japanese Spitz puppies for sale and hundreds of Japanese Spitz dog breeders, you're sure to find the perfect Japanese Spitz puppy.